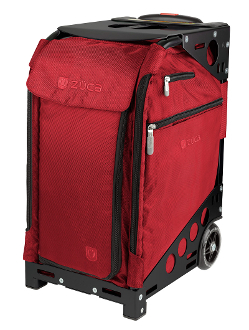 ZUCA Pro Travel Ruby Red & Black Carry-On Bag. You can easily fit between 6-7 days worth of clothing (depending on the season) into one of the best carry-on pieces of luggage you can own. Great for the professional, leisurely traveler or kids and parents on competitive travel teams. The five removable packing pouches (color coded by size) stack like drawers: 2 red (5"x 8"x 10.5"), 1 blue (3"x 8"x 10.5"), 1 orange (2"x 8"x 9.5"), 1 green (3"x 8"x 10.5"). The clear TSA compliant zipper pouch makes for easy packing for your liquids.